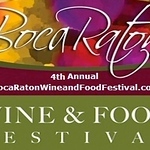 Please your palate, step into your stride and enjoy the largest outdoor Culinary Affair in South Florida during the 4th Annual Boca Raton Wine & Food Festival on Friday, November 8th, Saturday, November 9th, and Sunday, November 10th, 2013. This year promises to be a party no one will ever forget with four very special events over three days. Friday night kicks off the festivities with two unique events, the exclusive VIP Dinner Under The Stars, A Four-Course Food & Wine Affair; 7 PM to 10 PM, and the Vineyard Party, A Vine to Glass Affair; 7:30 PM to 10 PM. Then on Saturday evening, over 75 chefs from the tri-county area converge upon the festival grounds for the incredible BRAMAN Motorcars Palm Beach Grand Tasting, A Culinary Affair; 6 PM to 10 PM. Sunday morning join us at the Jazz Bubbles & Brunch, A Social Affair; Noon to 3 PM. Official Web Site - all details.